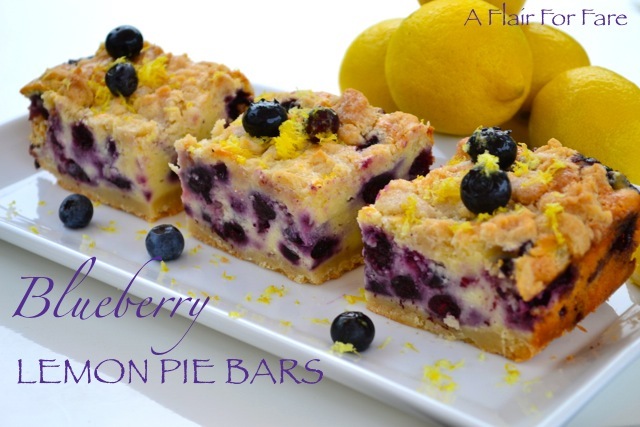 A refreshing summer treat, these bars are fresh and fruity, without being overly sweet. Prepare your pan. Choose an 8×8 or 9×9 baking pan, line with parchment or foil, leaving an overhang on the sides of the pan. Prepare the crust. In a medium mixing bowl, combine sugar and melted butter with half of the lemon zest. Mix in flour until well combined. Set aside 3/4 cup of the crust mixture in the refrigerator. Add remaining dough to prepared pan and press in evenly. Bake for 18 minutes. Prepare the filling. Using a hand mixer or stand mixer, beat softened cream cheese on high speed until smooth and creamy. Add eggs and continue to beat until well combined. Scrape down the sides of the bowl and add sugar, lemon yogurt, remaining zest, lemon juice and salt. Mix well. Add flour and mix just until combined. Using a spoon or a spatula, gently fold in blueberries. Remove crust from oven when done and pour filling over crust. Spread evenly. Crumble reserved crust over top and sprinkle with sugar. Bake for 55-65 minutes until lightly browned, test with toothpick for doneness. Move to a wire rack and cool to room temperature. Cover with foil and move to refrigerator for at least one hour. Once completely chilled, lift out of pan and cut into bars. Top with additional blueberries and zest, if desired, and serve. Store covered in refrigerator for up to 5 days.